Are you planning to spend some quality time with your family at Mardi Gras? Don’t waste the bright chances of doing so! 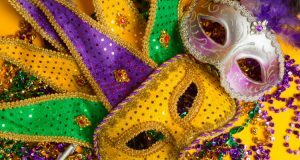 For some of us, Mardi Gras is a rite of passage or a long-standing family tradition that dates back to the early 18th century. For others, its a pre-spring break escape of wonder and excitement to travel, let go and celebrate. 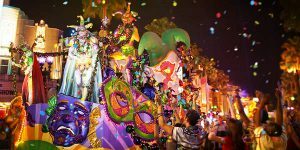 Whether you favor the lights and sounds from the many Krewes that make up the carnival season and its famous Gras or the many culinary delights that Louisiana is known for, this town awaits you with true sensory overload. For first time visitors, or even returning visitors, the first thing you must do is stop into the famous, and rightfully so, Cafe Du Monde. No trip would be complete without their warm and delicious Beignets. People far and wide trek the globe just to get their hands on these mouth-watering sweet treats. While you’re at it, grab some of their frozen coffee and you’ll be all set to walk your way through this amazing city. A couple of tips to remember: first, they only accept cash; second, that long line you see out front is for the first publicly available restroom this side of town; finally, this is a seat yourself cafe, which is often quicker than the take-out line. It really was lovely to talk to the waitress and gather up some advice on what to do and see in this lively city. As you walk yourself down Decatur Street, you’ll see an assortment of shops and boutiques that make up this scenic journey. You’re guaranteed to find many mask designers, souvenir shops and artists all showing their wares available for sale. After we browsed a bit during our trip, we decided to stop and watch one of the many impromptu performances that randomly spring up all over the city. This show took place in an outside amphitheater sitting right in front of the famous Jackson Square. After we enjoyed our Beignets and frozen coffee, took in that truly funny show and walked through Jackson Square, it was now time to walk down Saint Peter’s Street to the famous Bourbon Street. As we arrived upon Bourbon Street, we were immediately transferred into a lively celebration like no other, with crowds of people cheering with excitement as colorful beads descend from the balconies above. Block after block, celebrations of food, drinks and voyeurism are to be found for those willing to indulge. While there are many legendary places to eat and drink on this street, lines can be long and most places close fairly early, so plan accordingly. I recommend trying some seafood Gumbo, craw fish and fried catfish. Before leaving Bourbon Street, you’ll want to grab some of that legendary King Cake and a giant Fishbowl because it is guaranteed to be a long festive night. 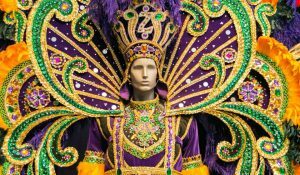 For the entirety of a month, the city will feature parade after parade to help celebrate the Carnival season. When we arrived, they were celebrating Lundi Gras, which features the third oldest parade Krewe, know as the Krewe of Proteus. While waiting for the sun to go down, you can feel the excitement ready to burst from the scores of eagerly awaiting children and adults of all ages. It is then that the city transforms into a magical parade of lights and sounds. The smells of carnival classics waft in the air as the countless teams of marching bands, with their enthusiastic dancers and colorful costumes, lead the way forward. Float upon float of musical notes and color-bursts stream forth as beads shimmer in the night. Illuminated by the lights that shine forth with every bit of the excitement of a Hollywood premiere, person after person shouts forth and jumps for his or her souvenir. Whether it be beads, mini footballs, glowing rings, fidget spinners or any number of the countless items being thrown at you, you are definitely going to have a most memorable trip in New Orleans.